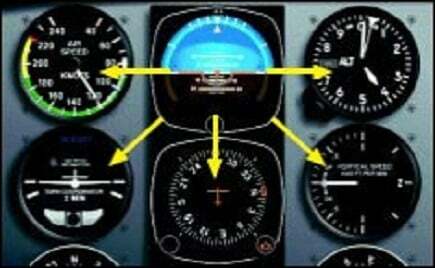 Flight instruments are divided into the following three categories. Turn coordinator (TC) or Turn and bank indicator. ATTITUDE INDICATOR is the primary instrument to indicate aircraft attitude, it shows: Pitch and Bank attitude. Airspeed indicator Airspeed Pitch attitude. 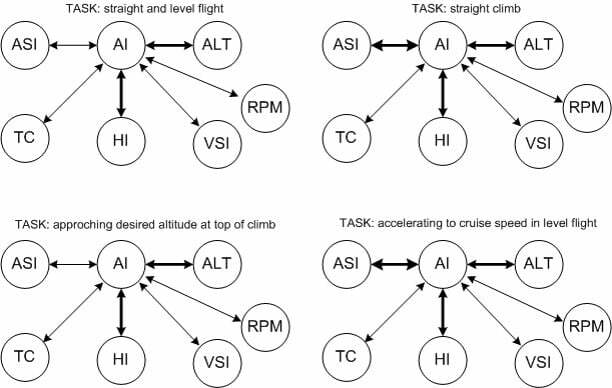 Vertical speed Indicator climb/descent rate Pitch attitude. Heading Indicator Heading Bank attitude. Turn and slip coordinator Yaw, coordination Bank attitude. Turn coordinator Yaw, roll, coordination Bank attitude. Magnetic compass heading Bank attitude. Focus primarily on the attitude indicator. your eyes never travel directly between the flight instruments but move by way of the attitude indicator. Other instruments are scanned less frequently for backup information. What information do I need ? Which instruments give me the needed information ? Is the information reliable ? What is the main instrument during flight instrument ? What are the different categories of flight instruments ? What are the questions you have to ask yourself to develop a good scan technique ?